Beginners will be more comfortable in the long run if starting out with an air gun, not only because of the weight, but the intimidation factor lessons with not having to worry about special holds, advanced scopes, or any of the nuances (or read advantages) when using an air rifle. The only drawback is the lack of power, a noticeable drop from using an air rifle. But with the lesser weight, less power, and easy portability, comes ease of use for a beginner shooter that can’t be replicated with even the most user friendly air rifles. There is no extreme cocking weight to worry about, and all in all, an air gun just works. Of note are the trigger differences when using an air gun, not really so much a difference as it is the feel changes. This includes before the release of the trigger, and during the recoil stage which can be much more specific since the shooter is using one hand to fire. A lot of the accessories are also not available, as it is handgun style. The advanced scopes found on air rifles are replaced with air gun specific scopes, and in many cases no scopes at all. So user error is much more prevalent depending on the experience of the shooter. The use of manual aim is not so much a downfall of using an air gun, as it will grow good mechanics for the beginning shooter. When a user finally graduates to a scope, there will already be a solid foundation to build upon by practicing with an air gun. The below air guns do a fine job of both introduction, and inclusion into current collections for the more experienced shooter. First up is the Crosman Bolt Action CO2-Powered Pistol, a .22 caliber single shot bolt action air gun that shoots up to 460 FPS. Easy to use and weighing in at only 29 oz. but still capable enough to take down small pests. There are plenty of aftermarket parts to customize the gun to the users liking, so it makes a wonderful shooter for the hobbyist as well. It is advertised to go 30 shots without going too far off and losing the power from the clip, but some have reported that it goes as high as 35, so good bang for the buck. Keep in mind that since this is a C02 powered air gun, there is the added expense of the cartridges, but in reality the cartridges are no more expensive than a box of generic .177 caliber pellets. The sights on the gun can be manually adjusted with a small tool, and with the aforementioned modding, a scope can be added. The Crosman Bolt Action CO2-Powered Pistol is a fine air gun from a respectable company. With easy to use mods and plenty of parts, it is very accessible to all shooters of all experience types. Crosman strikes again on the list with the American Classic Pump, a .177 caliber pump action that shoots up to 600 FPS. Being sold as an easy pump forearm, per the air gun design that holds true and the single-action bolt design adds to the air guns overall luster. Although just a .177 caliber, the Crosman American Classic does good work for pest control as well as target shooting. While the first air gun on the list uses the more advanced cartridge technology, this particular Crosman relies on elbow grease. Between 3-10 pumps decides the minimum and maximum amount of power to use when firing off a pellet. Users are also not burdened with a limited amount of shots per cartridge, and the purchase of such cartridges. As far as the downsides, there have been numerous complaints about the sights being below par, even with adding better sights since the barrel twists and can throw the accuracy off somewhat. This air gun also has a slightly longer barrel than most of its types, and helps in the long run with overall accuracy, and even with a mini project a hobbyist wants to turn it into a mini air rifle. 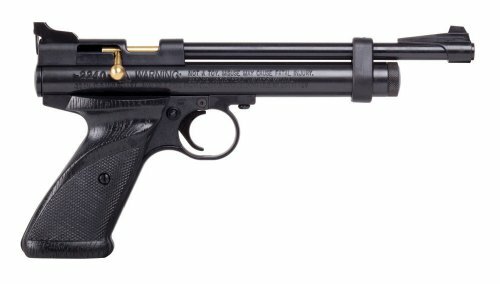 Even with the mentioned flaws, the Crosman American Classic Pump Air Pistol can reach the status of more expensive air guns within its range by simply adding modifications, an option that Crosman seems to openly support with its product. .177 calibers still can get the job done, as this Daisy is a CO2 powered semi-automatic with a built in 21 shot BB magazine. 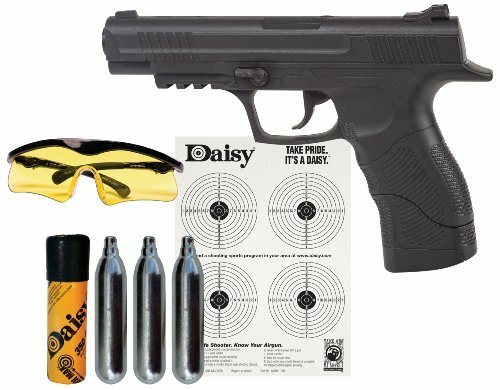 The Daisy 985415-442 Hunting Air Pistol is unique in that it comes with an entire kit containing shooting glasses, targets, 350 ct. BB tube and three CO2 cylinders. Pretty much everything a beginner needs to get started with shooting is available right out of the box, making this a very attractive package. The unexpected 500 FPS is just the beginning of the story, as the looks show a design that can easily be mistaken for a real handgun. Another good feature is the red indicator that lets the user know the safety is off, and it fires off a cool 80-100 shots before losing too much power. There are fittings for other accessories such as lasers and flashlight devices, if needed. There isn’t an air gun on the list that beats the value that the Daisy 985415-442 Hunting Air Pistol provides in one complete package for its retails price. Whether using it for pest control or even target control, this air gun is the best bang for the buck when comparing features and overall value. Other than having the coolest name on this list of air guns, the Colt Defender Pistol is a very capable CO2 powered air gun with a built in 16 shot BB magazine. Although not as robust as the Daisy in features, the fixed front and rear sights are a welcome addition. A spring powered grip release also gives the shooter comfort in overall quality, both short term and long. Although only 1.6 lbs., it shoots a solid 450 FPS and strongly resembles a Colt firearm. A good 80-100 shots can be expected before losing too much power, so pretty much standard wear. The usual pains of CO2 cartridges leaking are here with this version, as well as any CO2 powered air gun that is not properly cared for. One of the few downsides to the air gun is the loading mechanism, which can be a bit difficult at first until used a couple of times. 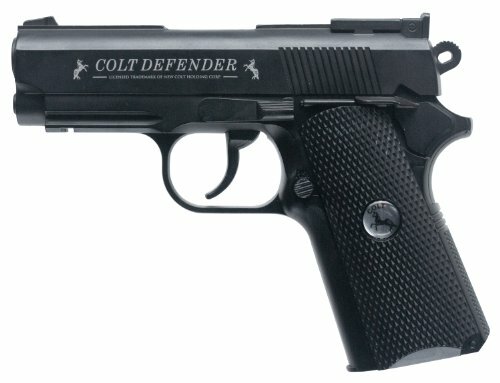 There are a lot less features in the Colt Defender Pistol than other air guns, and it doesn’t shoot any better or any worse than any of the list. With the loading mechanism being the pain that it is, it is still a quality buy solely for the high grade plastic materials that they use to construct it. With one of the most interesting takes on the classic revolver, Crosman dominates the list again with the Crosman CCP8B2 Vigilante. Capable of 435 FPS, this CO2 powered single or double action firing air gun handles up to a 10 pellet clip, or 6 shot BB clip. The included rails makes adding accessories a no brainer for target practice, plinking, and light pest control. 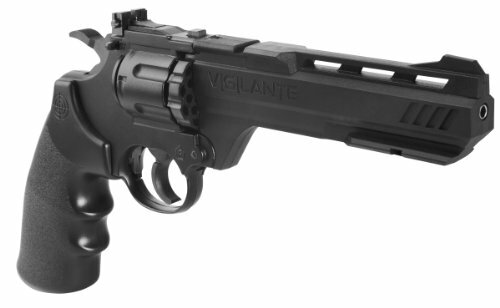 The weight of the air gun lends a lot of familiarity to the revolver it is modeled after, and the Vigilante clocks in at about 2 lbs. Even though this Crosman is of value price, it is able to easily handle rapid fire double action without any problems. As far as loading the BB’s go, this air gun suffers from the same frustration that others do. The feature set this dual ammo revolver is quite nice, and the value speaks loudly as well. Other than a few gripes like the way the Bb’s are loaded and having to remove both grips to install the CO2 catridge, it holds up well for beginners and experienced users. With the weight, and barrel of that length, the Crosman CCP8B2 Vigilante CO2 .177-Caliber Pellet and BB Revolver is a great buy. 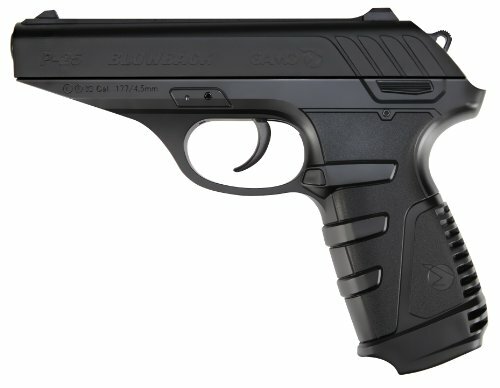 The modern looking Gamo P-25 Blowback Pellet Pistol won’t win any design awards from the old school, but this .177 caliber brings it’s a game with a Semi-Automatic Blowback action in a metal frame. It also remains as one of the more comfortable air guns on the list, not only for the weight, but also the textured grip. The quality of this air gun is unmistakable, even if it comes with less bells and whistles than the others. Does an acceptable job as pest control, target practice or general plinking and the sliding blowback action will impress peers. CO2 life looks good at around 40 before needing to be replaced, and at 450 FPS should be a lot of fun for any user. Accuracy is hit or miss, mainly because of the cool realistic sliding blowback feature which curiously affects shooting as well. But that remains as one of the few downsides of an otherwise excellently made air gun. Too few air guns opt for the modern look, with many throwback styles popping up all over the warehouses, but the Gamo P-25 Blowback Pellet Pistol sets itself apart from those in a good way. It lacks the option of BB’s, but with the myriad of pellets available for .177 calibers, shooters won’t miss a beat. Most of the air guns listed are from well-known manufacturers with heavy support, from the lesser known Umarex comes the Umarex 2254821 TDP 45 410FPS CO2. Capable of velocities of up to 410 ft. a sec, this small BB air handgun does just enough for what it is worth. Ideal for shooting targets and plinking, pest control is not recommended with this model. It is ultimately a beginner air gun, and markets itself as such. There is still the option of using a loader with it, but once again that is purely optional. The trigger pull is decent for an air gun of its size, as Umarex did a good job of adding in only necessary components. It does include a weaver rail, and is easy to add whatever is necessary to an already good purchase. As far as features and overall comparison, the Umarex 2254821 TDP 45 410FPS CO2 is average across the board. That’s not a bad thing, it just doesn’t do anything to stand out from the other air guns listed. Being the smallest on the list though, Umarex has made an air gun that any green beginner can appreciate and use. Accuracy with an air handgun differs from an air rifle when planning to use it for the humane hunting of pest and small game. The power is just not there for mistakes, so the area of impact becomes that much smaller for the user, in fact about the size of an American quarter. There are not a lot of powerful air guns on this list, and even the ones not on this list are not that much more powerful. With accuracy being the key factor in determining a humane kill, it becomes easier to point out the less obvious choices for hunting with an air gun like with BB’s, near empty CO2 cartridges, and without the proper sights or scope. Pellets are easy enough to come by, and the types of pellets to use follow the same guidelines as when using an air rifle. For the novice hunter, an air gun in a holster makes a perfect companion to an air rifle on a sling. 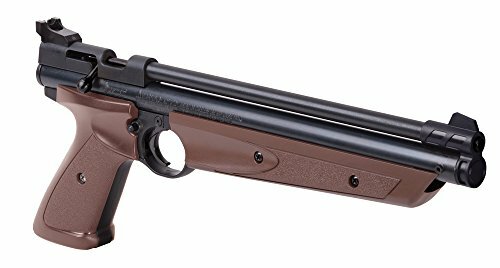 Air Guns like the Crosman American Classic Pump Air Pistol can even be modified into mini air rifles, not just for show, but for actual hunting use. By rule of thumb, when deciding what is acceptable to use for hunting, an air gun should have no output lower than twelve foot pounds. Aiming becomes a bit of a chore, as there is no military hold for an air gun to exercise hitting a better mark. Good practice and marksmanship make for a better hunting experience, regardless of the type of air gun or air rifle used. There really is no reason to have this discussion, and it is often had by many. They are two very different types of machinery, even though they do the exact same things. It would be like comparing a sedan to an SUV and expecting an apples to apples comparison. The choice to us an air gun over an air rifle might come into play for those who are brand new to shooting, and as such would serve as a good introduction the world they are delving into. When hunting comes into the mix, an air rifle would be more appropriate, and an entirely different skillset needs to be learned, appropriately on top of the one taught with air guns, if necessary. There really is no wrong choice between the two, and it is completely up to the user to decide whether what they buy can serve its intended purpose. When deciding on the best air gun for 2016, the same rules apply for when deciding on the best air rifle. User whatever suits that particular shooter the best, whether it be for accuracy, power, modding, collecting, or even as a companion piece to hunting. There are many other air guns not in this list that may fall in line with what the particular user wants, so shop around. Best value for the money can definitely be tipped to the Daisy 985415-442 Hunting Air Pistol, which serves as an air gun starter kit. As far as a future proof package, the cool modifications available to those who purchase the Crosman American Classic Pump Air Pistol may prove a better value in the long run for those experienced in tinkering. The models listed are decent enough to not only assure a good purchase, but to also serve as a starting point to a deeper search into what air gun works best for any particular shooter. The pellets and BB’s are interchangeable between air rifles and air guns, so whatever arsenal the user has before the purchase will work well out of the box. Keep in mind that there is either no cocking effort, or a hugely reduced cocking effort when dealing with air guns. With no wrong choices to be made, going air gun hunting is a dream come true.